Babies are often squirming and flailing about, which makes washing and bathing your baby that much harder. With the No-Juggle baby towel, you no longer have to juggle your baby in one hand and use a towel in another. Two machine-washable silicone tabs locks the towel around the back of your neck which will hang the towel down your torso, protecting you from splashes. After you have finished bathing your baby, you can also lay them against your chest, reach down the other ends of the towel, and cover it over their head to swaddle them. Another accessory to make bathing your baby easier, the collapsible baby tub is a space-saving basin-style bathtub that adjusts to your baby’s needs. The tub can be adjusted to a reclining position on one end, perfect for giving newborns a bath. When the baby is ready to bathe sitting up, the bottom expands back down to comfortably fit your baby. The collapsible baby tub also comes with a slip-resistant base and a drain plug for safety and ease of use. You can place it on top of the kitchen counter, on the floor, or in your bathroom. After using the tub, it can lay flat and can be hung for easy storage. Traditional highchairs are bulky and cumbersome. They also take up a lot of space and can be very difficult to clean up. The hook-on highchair is a portable alternative to a regular highchair by being able to attach to most flat surfaces. This highchair easily hooks right on the edge of your table, making it more convenient for your baby to reach your dining table when eating. It can easily be folded up and placed inside an included carrying case so your baby can always sit with you even in places without highchairs. You can even attach the hook-on high chair to your kitchen counter and let your baby watch you while you go on about your day to keep him or her happy and entertained. You’ve managed to put your baby to sleep in their room and you finally have some time for yourself to relax or do some chores, but you don’t want to leave your baby completely unattended. A baby monitor allows you to check up on your baby even if you’re not in the same room. Basic models work as one-way radios that can tell you if your baby is crying or stirring about, while more expensive models can be two-way radios so you can also talk to and calm your baby down. Higher-end devices can even give you information like temperature, body position, abdominal movement, and fall detection, which can be sent to your smart device. Parents deserve all the help they can get when taking care of their babies. Luckily, baby accessories and products that can make a parent’s life easier are now more accessible. 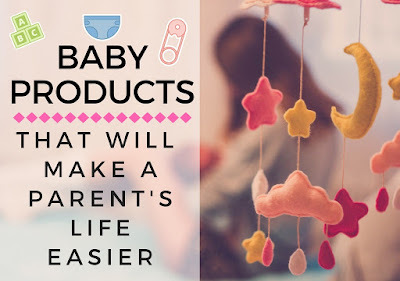 Be sure to take advantage of these products and spend less time worrying and more time enjoying with your baby.